In the last CloudFormation post, Generating CloudFormation Templates with Lono, the stack was intentionally designed simple to allow focus on learning and understanding CloudFormation basics. The stack was not really been useful in real life. Today, I’ll walk through a CloudFormation template that is extremely practical and useful for real life use cases: an AutoScaling App Tier. NOTE: All the source code for this post is available on Github: tongueroo/cloudformation-examples-lono. An AutoScaling App Tier is a extremely useful stack because it is the standard stack to which you can deploy and run application code. One of my first thoughts of when I first learned of EC2, AutoScaling and CloudFormation was: Why not just launch a fleet EC2 servers and not bother with AutoScaling? It’s more work to figure out AutoScaling and I just want to get servers up and running fast. I was hesitant to take on learning AutoScaling for time concerns. Ensures highly availability of infrastructure. If there’s a weird one off instance that is misbehaving, AutoScaling will terminate it and replace it automatically. Robots can do mechanical things like this faster than humans. Provides infrastructure scaling knobs to adjust if needed. There is little point in starting the CloudFormation template from scratch. 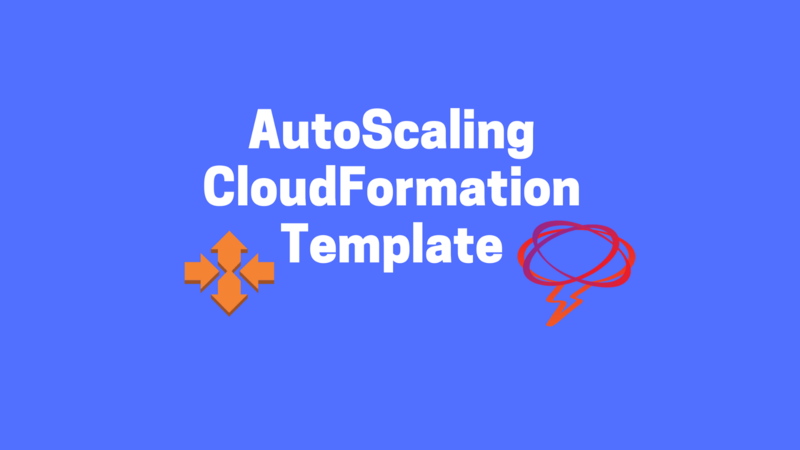 So let’s head over to the official AWS CloudFormation sample templates and grab the Load-based auto scaling sample template. Okay, so now we have a very good idea of what is required to make this template work. I prefer to work with CloudFormation with yaml so I’ll convert the template to yaml before taking advantage of using lono to clean up the template further. Moving the scripts into these lono partials makes them a ton easier to read. Okay, now that we’ve downloaded the template, updated it to use lono and generated the templates to the output folder, we can get ready to launch the stack. Note these the VpcId and Subnets values need to be change for your AWS account. Let’s create the stack now! Remember to generate the CloudFormation templates using `lono generate` again if you have made changes. If you would like to have the templates continuously generate as you make changes, you can also run bundle exec guard, covered at Continuously Generate CloudFormation Templates with Lono and Guard. 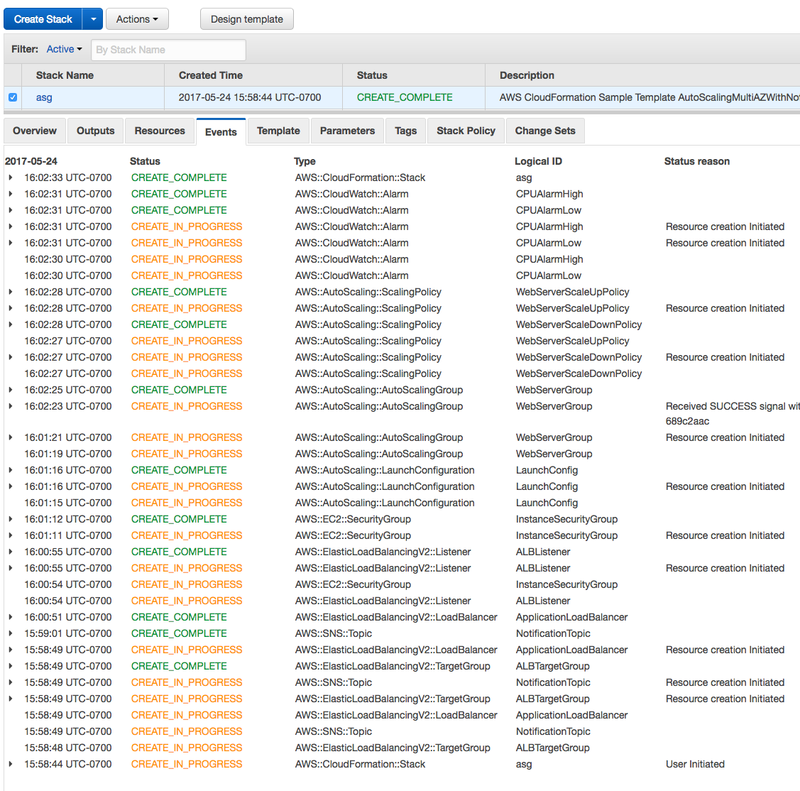 The stack with all the resources: AutoScalingGroup, LaunchConfiguration, SecurityGroup, Listener, LoadBalancer, TargetGroup, SNS::Topic, 2 ScalingPolicies and 2 CloudWatch::Alarms, took only 4 minutes to create. Congratulations, you have successfully create an extremely valuable CloudFormation App AutoScaling Tier stack. I have found that this is one of the most commonly used stacks in real life. In the next post, I’ll cover lono, a tool that makes the process described in this post even more simple: Easily Manage CloudFormation Templates with lono cfn. Thanks for reading this far. If you found this post useful, I’d really appreciate it if you recommend this post (by clicking the clap button) so others can find it too! Also, connect with me on LinkedIn. P.S. Be sure to join the BoltOps newsletter to receive free DevOps tips and updates.